Valentine flowers are wonderful. 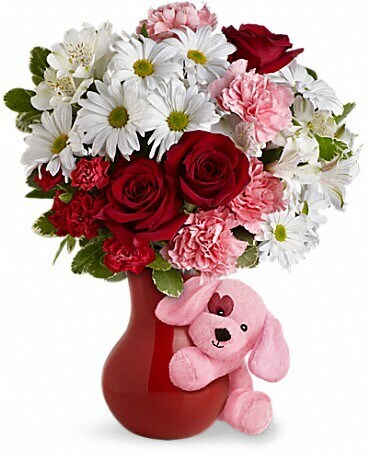 Valentine flowers plus a hug from a cute pink puppy - absolutely irresistible! Delightfully affordable, this is a doggone great gift for all the Valentines on your list. They'll love it! Who couldn't use a hug? Give her an especially sweet one from a cuddly pink plush puppy delivering fresh flowers in a charming red ceramic vase. Three delightful gifts in one - a triple heart winner! This adorable red ceramic vase accompanied by a pink plush puppy is another exclusive from Teleflora's Flowers-in-a-Gift collection. The detachable puppy will provide years of hugs.